I am animal crazy…just ask my dog. So it’s no surprise that when looking for an innovative way to help staff collaborate, I looked to Canada’s animal kingdom for inspiration and a little fun. Amiable and patient polar bears account for approximately 45% of a library’s staff. Think of circulation staffers as great examples of the people-friendly, big white bear with which we Canadians are so enamoured. These are the outgoing, front line staff members who love serving the customer. Analytical, problem-solving beavers make up approximately 35% of a library’s staff. Technical Services and Finance employees are good examples of the library beavers. They see both sides of an issue and like to stick to the facts. They are all about the details and accuracy, which is just what you need from the staff monitoring the library budget or looking after the catalogue. Approximately 12% of a library’s staff is composed of focused and intense red foxes. Good examples of the red fox personality are usually found in the IT or Information departments. These staff members are generally quick learners, precise, and accurate…perfect as a reference librarian! The expressive, team building otters are approximately 8% of a library’s staff. These are the high-energy, creative employees. Kids’ librarians, grant writers, and marketing staff typically have an otter personality. These staffers learn by playing and see rules as “just a suggestion.” Otters are usually the library’s early adapters. After staff decided which animal they were, we divided into departments and explored how to better communicate with each other. As CEO, I was looking for a variety of animals in each department. Of course, the public service departments had the majority of the polar bears, but also they had a few beavers and an otter. It’s this mix that makes the departments really work as a team and helps them focus on service excellence. This workshop isn’t an exact science, and not everyone will fit exactly into only one animal persona. However, it does get staff talking about how they communicate with each other and how they can better communicate with our customers. I know this was a successful Staff Development Day, because three weeks later, they are still talking about being a red fox and how to better talk to a polar bear. Library staffers are animals, at least in Guelph! Have a great week! P.S. 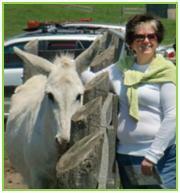 Yes, that is me at The Donkey Sanctuary of Canada.